Parkinson's maiden victory marked the end of the three year dominance of the 1928 Phoenix Aviation Ford Tudor which was not entered to this year's event. Parkinson's calm and assured match to the podium belied the excitement that was bubbling underneath and at exactly 5pm it exploded in a solid stream of joy. Parkinson scored a total of 276 to beat John Wroe's 1990 Ford Model A and Sati Gata Aura's Nissan 160J to the podium positions. Sati Classics dominated the bikes class claiming the top two positions. Their 1958 Norton Race scored a total of 179 points to clinch the motorcycle class. Sati Classics 1981 Yamaha finished second in the bikes class. Kevit Desai in a 1968 Jaguar 420 notched a total of 261points to emerge the winner in class 11 for touring cars and station wagons over 4000cc. Uganda's Ronald Walusimbi in a 1974 Mercedes W114 won class 8 for Touring cars and station wagons from 2001cc to 1500cc. South Africa's Ronald Nancekivell in a 1957 NSU Supermax won the street motorcycle class of up to 350cc.Second in the class was Kenya's Russell Hughes in a Dugati 65T. Nancekivell's 41 year old machine scored 35 on external finish, 44 on engine/mechanical and 43 on trim.Sati Gata-Aura in a 1978 Nissan 160J scored a total of 268points to emerge the winner in Class 5 for Touring cars and station wagons from 1301cc to 1600cc. Gursharan Singh in a 1978 Alfasud Sprint came in second with a score of 220.Sati who was the event's overall car class winner in 1988 and 1993 was the best scorer on the underside with 39points, 73 on external finish and 6 on road worthiness. Pomp and color marked the 46th edition of the Concours with close to 10000 spectators being treated to some exhilarating displays of car beauty. This years event organized by Alfa Romeo Owners Club of Kenya and sanctioned by Africa Motorcycle Federation, FIM attracted 76 cars and 35motocycles. The event attracted 29 competitors from outside Kenya which set a new record for overseas entry.Six of the cars were from Uganda and three from down South. The rest were 19 members of the Uganda Bikers Association (UBA) who rode to and fro Uganda to honor the Concourse.Chairman of UBA Mr. Donato Laboke had this to say after the conclusion of the event: "September has always been a special month for Ugandan bikers. Its the same month I was born so every year I miss out on the Concours I feel sick. I want to thank organisers for their continual support. 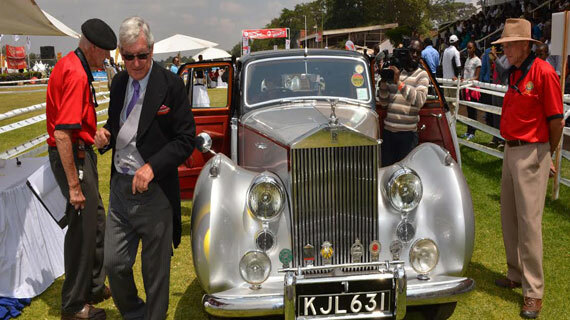 I'm glad that CBA are sponsoring the Uganda Vintage event next year and we expect many Kenyans to attend. We have been in existence for over 10 years and I must admit that UBA was and still is a close family. This year has not just been about riding to Nairobi, our theme is fighting cancer. We have kick started our campaign by visiting a number of hospitals in Uganda. Next year, we will ride to South Africa around September and end our trip in Nairobi for the Concours."